Flashback: Willie Nelson, Merle Haggard Cover the Beatles' 'Yesterday' . Beatles Radio: The Beatles, Solos, Covers, Birthdays, News The Fab 4 and More! 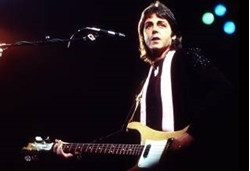 Forty-four years ago this month, former Beatle Paul McCartney and the members of his current band, Wings, arrived in Nashville for a month-long vacation and rehearsal. McCartney and his entourage stayed at a farm just outside Music City owned by famed songwriter Curly Putman Jr. ("D-I-V-O-R-C-E," "Green, Green Grass of Home") and made a visit to the Grand Ole Opry, which, to McCartney's disappointment, had recently moved to Opryland from the location the Liverpool native was anxious to visit, the Ryman Auditorium. On June 16th, McCartney and his wife Linda were among the audience at a historic Opryland performance featuring longtime partners Dolly Parton and Porter Wagoner, with Parton telling the crowd it's "the last time we'll play together."